Jordy Buijs in action for Sydney FC. SYDNEY FC defenders Jordy Buijs and Luke Wilkshire have left the club, with Buijs returning to his native Holland. 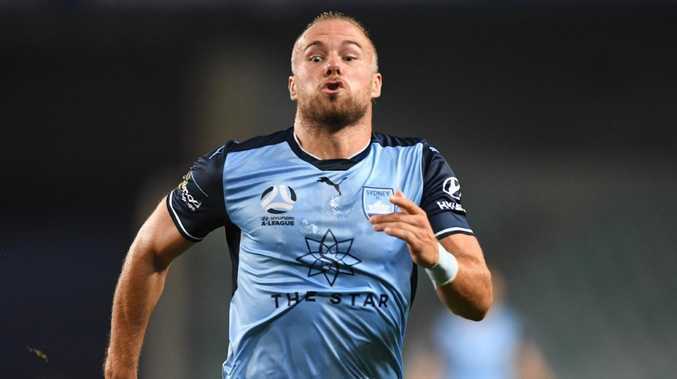 Speculation had been mounting in recent weeks that Buijs, 29, would leave the Sky Blues, with cross-city rivals Western Sydney Wanderers thought to be a possible destination. Sydney had been keen to keep Buijs but that task may been made more difficult when he was left out of the club's Asian Champions League squad this season. Former Socceroo Wilkshire, 36, arrived at Sydney in July last year as an injury replacement for right back Rhyan Grant and enjoyed an impressive season, making 25 A-League appearances. Wilkshire had finished a second stint at Dynamo Moscow and was contemplating retirement when he got the call from Sky Blues coach Graham Arnold. Buijs said he was proud to have played at the club but it was time to move on. "It has been a wonderful experience for me and my family over the last 16 months to be a part of the greatest team in Hyundai A-League history," Buijs told the A-League website. "I have won four trophies, made some fabulous memories and friends and I am very proud to have been on this journey with the club but now it is time to seek out another challenge. "I would like to thank the club, particularly Han Berger, for giving me the opportunity to play for Sydney FC. The experience has brought us closer. "It was a pleasure to follow our captain Alex Brosque, for whom I have the utmost respect, and also to play alongside great players in this squad, including my friends Adrian Mierzejewski, Milos Ninkovic and Luke Wilkshire. "I just wanted say a big thankyou to Arnie, the boys and all the staff at Sydney FC," Wilkshire said. "It's been an amazing season and it was an amazing opportunity offered to me by the club to come back and play in Australia which I thoroughly enjoyed. Luke Wilkshire celebrates scoring for Sydney FC. "I'd like to wish the squad and everyone all the best in the future and rest assured I'll be watching on." Sydney FC's football manager Terry McFlynn also paid tribute to the defenders. 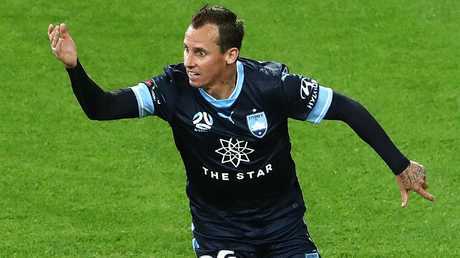 "Jordy has been a fantastic addition to Sydney FC and I would like to wish him and his family the best for what lies ahead," McFlynn told the A-League website. "He has performed admirably for the club but in football people move on in their career and we respect Jordy's wish for a fresh challenge overseas. "I would like to thank Luke for his wonderful contribution to the success of our football club," he continued. "Luke provided great leadership and guidance both on and off the park to our playing group. "Both players will be forever a part of our Sydney FC family and will always be remembered for their contribution to the most successful period in our history." Buijs joined the Sky Blues in January 2017 following the departure of fellow central defender Matt Jurman to Korea and quickly made an impact as Sydney stormed to the A-League double. He signed a contract extension that kept him at the club for the 2017/18 season where he topped the A-League passing charts with 1369 completed passes, ahead of Melbourne City midfielder Luke Brattan with 1284 passes. Buijs made 40 A-League appearances for Sydney and won an A-League title, two Premier's Plates and the FFA Cup. Meanwhile Sydney have signed central defender Alex Wilkinson for a further two seasons.